The audio amplifier you use from day to day has three main blocks: (a) pre-amplifier with tone controls, matched to the source whether it be a CD player, your turntable, tape deck, DVD player, iPod etc – the preamp is essentially a voltage amplifier which consists of the transistors amplifying the signal across high impedance loads in the magnitude of thousands of ohms to a few hundred ohms at it’s output – this is then matched to the power amplifier which is mostly low resistance/impedance except for possibly the input. A good pre-amplifier does not lose signal fidelity – there should be no noise amplification and the output should replicate the input – except for amplitude and possibly bass or treble boost and cut. As our leaning here is more to power amplification we won’t cover all the stages in a pre-amp but move straight on to the the next stage, the pre-driver and then the driver and power stages. The amplifier output stage above was a highly successful design in the 70s featuring an NPN/PNP output stage typically driving 4 ohm or an 8 ohm load. Into 8 ohms this amplifier would have dissipated about 20W with a supply rail of 30V. Q4 NPN and Q5 PNP form the output stage running in push pull configuration class AB, Q3 PNP is the driver transistor. Only with the later and more popular changes to this power supply where there were + and – rails was the output directly coupled to the loudspeaker, in turn connected to the transformer center tap or 0V (GND rail). The most common failure in these amplifiers were the output transistors usually due to over current through short circuits. There was no current limiting available – it was strictly a budget amplifier. Midrail voltage (loudspeaker) was never that much of a criteria as the coupling capacitor took care of any voltage offset – however in proper design both halves of the sine wave should be equal and the crossover distortion minimised by sufficient bas current. Q1 and Q2 play a very significant part in this circuit design. 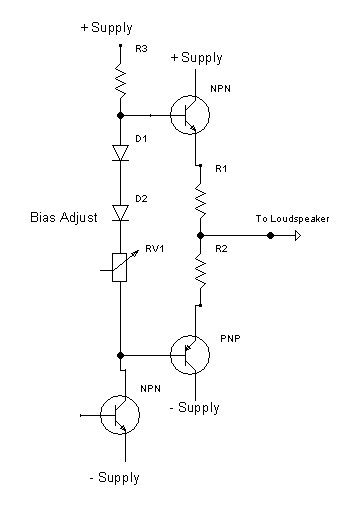 Q1 amplifies an out of phase signal (compared to input) to Q3, negative feedback is derived from the loudspeaker rail (output) back to Q2 which shares emitter resistor with Q1. Q1 and Q2 are known as a differential amplifier or long tailed pair – these two transistors compare the input to the output. Although a very simple circuit quality was usually very good. Note that with this amplifier the output devices are biased to class AB and Q3 to class A. In larger amplifiers the drivers may also have been biased to class AB whilst a pre-driver biased to class A – in simple terms, the more output transistors, the more drive required to drive higher currents through the load.